Time to put my money where my mouth is. This is where you get to find out exactly what I’ve purchased, the amount I purchased, and at what price. I’m going back a whole seven months to show you which cards I’ve been picking up this year. At the end, we’ll see whether or not they worked out in my favor and what I’ve learn about my pickups. Why this goal? Because I’ve been burned in the past, and also very recently, on cards where I decided to go the non-foil route over the foil. Since my past mistakes are too numerous to list here, my most recent example of why I crafted this goal was because of Griselbrand. Guess who was announced this year as the GP Promo for the following year? That’s right, my boy Griselbrand who I had acquired during 2013 at $8 per copy. I had accumulated twelve copies by the time of this announcement. Let’s just say I was lucky to buylist them for the price I paid. The only exceptions I allow myself to this rule are for Standard and reserve list picks. I tried to stick to this this goal as close as possible but didn’t adhere to it every time I picked up something. Another reason I like foils is because they are especially good targets for Commander staples, which have proven to be good Magic financial gainers. A great example of this was when foil Chromatic Lanterns were everywhere and I was picking them up for $7.50 or cheaper. Now they’re $15 and rising as time goes on. Booster boxes and packs are really fun to purchase though are a losing proposition in the long run. There are way too many bulk rares out there these days to make flipping boxes into a profit for guys like me that don’t own a store but want their collection to steadily rise in value. This is a lesson that took me way too long to learn. Now that I finally have, I try to avoid buying boxes and packs for pleasure. When I first started experimenting with Magic finance I would pick up any bulk rare that I thought was cool, expecting it to eventually go up to the price that I thought it should be at. Several years later and I still have a box of failed specs that haven’t gone anywhere. Even worse, some have dropped considerably in price based on my whimsical logic. This was certainly the most expensive lesson for me to learn, even more so than buying random boxes and packs for “value”. At least packs sometimes produce cards people want that you can use to salvage some of your costs. Bulk rares can stick around for years without moving. It’s not technically a loss on paper because I haven’t gotten rid of them, yet I’ve come to realize that opportunity cost is a real thing. What I spent on bulk rares and questionable cards I could have put into staples that I knew were going to be fine in the long run. My most glaring example of this is I should have just picked up more shock lands rather than try to find “undervalued” RTR and GTC bulk rares and mythics. Now I’ve made it a point to pick up higher cost format staples that are undervalued either due to being in Standard or having a recent reprint. Rare lands that provide mana fixing from Standard like Mana Confluence is a recent example of this. Now that you know my goals for this year, I’ll provide you what I’ve purchased from now back until April 30th. The reason I picked this date to start is because I started formulating my goals mid-April and wanted to see the results of those goals from then on out. Here’s the breakdown of purchases and the estimated date of the purchase. All buy prices were TCG Median. 31 separate cards * $1.50 = $46.50. This brings the total spent up to $956.15. Buylist – How much can I get if I buylist all the cards right now? Using MTGPrice’s My Collection tool I’ve determined that the cash value of my collection when sold to vendors is $649.95. There seems to be some conflicting information here. I’ve gained in terms of retail but lost in terms of buylist? Let me explain further why the numbers resulted this way. Based on my calculations in the previous section, you can see that I thought I was erroneously ahead based on the retail value of the cards – in reality I am set back about 30% based on the pickups I’ve made this year. Seems like I’m doing bad right? Well, only if I decided to cash out this very second. Many of the cards I plan on holding for a while longer yet. You can can put pretty much everything from Khans into this category, including Jeskai Ascendency when I bought in during the hype of Pro Tour Kahns at $5. Retrospectively, it was a bad decision to buy into the hype and I need to restrain myself in the future of buying based on immediate fluctuation. Another reason that buylist seems so miserable right now is because the more expensive purchases, such as foil Conspiracy Exploration and foil M15 Sliver Hivelord, haven’t moved in price at all since I picked them up earlier this year. These would be examples of the long term holds I mentioned. I’m not planning on selling these at a loss simply because I know with time they are bound to go up due to causal and Commander demand. It happened for Chromatic Lantern and it will happen again here. In order to get the maximum amount from buylisting this year, I would have needed all of my speculations to double up or more – in seven months this was not going to happen to everything I was choosing. It just goes to show that mtgfinance is the ultimate waiting game if you’re looking to get the most out of future buylisting. Many of these cards I plan on keeping for personal use and I don’t care what the current prices are, buylist or otherwise. I expect to have them for a long time and can cash them out later when I know I’m not using them. Valuing at retail looks pretty sweet for cards like Hero’s Downfall and Doomwake Giant – if I can find someone to trade these to, I can really come out ahead if I pick up Modern staples or other casual format gainers like cards from the new Commander 2014 set. This would be the only benefit of a retail price increase. Now that the year is wrapping up and I’ve determined how I did, I want to add a few more goals to my list for next year. This is going to save me a few heartaches when I realize that those Doomwake Giants, even though doubling in retail, actually haven’t moved much at all on the buylist. Having more ways to trade cards away for retail value is essential for failed buylist specs like Doomwake Giant. By trading them at retail, you can ignore the abysmal buylist price and instead pick up a long term staple like Snapcaster Mage that will continue to be around for years to come. As soon as Pro Tour Khans was over, the prices went back down to almost where they started and have leveled off since then. Avoiding the hype is hard to do when the numbers are telling you different, but look no further than my own speculations to see that hype is gone in a flash and then you are stuck waiting a while longer for value that may not even arrive. 2014 has certainly been a learning experience for me. I’ve had success, but at the price of terrible buylisting options. I’ll need to either trade more aggressively once retail prices go up for cards I’m interested in or I will need to pass on the more aggressive spiking cards and instead aim for more stable long term gainers. Right now, my buylist loss of 30% is pretty big without even considering the shipping costs that would further add to that loss. However, I still believe the future is very promising for some of the cards I’ve acquired. 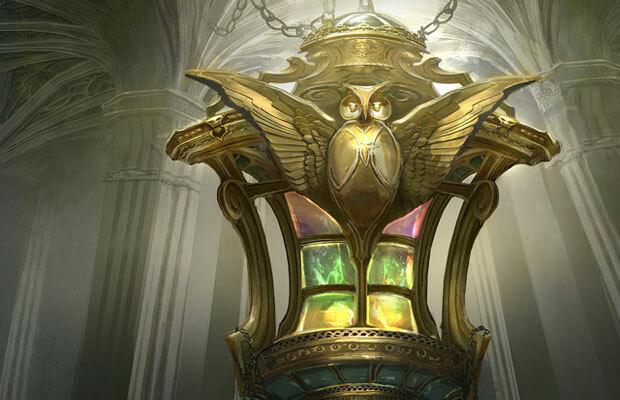 Foil Chromatic Lantern, a card that by every means had to go up in price based on the popularity in Commander, still took eleven months to double up in price from $7.50 to $15.00. The fact that many of the cards I picked up increased in retail price is also a good sign because this means if the cards continue to stay popular the buylist will have to increase in order to match the demand. The conflicting gains and losses that I discovered for my pickups is acceptable to me at this point yet there is certainly room for improvement. Since my loss would be so great from buylisting, I’m going to have to take the risk that the retail prices will continue to rise rather than getting 70% of the cash value of the cards right now and taking a 30% loss. Many of the cards I picked up are casual and Commander gainers so I expect them to retain their value for quite a while yet. I picked up a fair amount of foils that I believe will gain in the long term, limited my booster box / pack purchases, and severely restricted the amount of bulk rares I bought. I followed my goals closely but not close enough in some cases. There are still plenty of takeaways from this year. What does everyone think of my selections? Do you think I’m in trouble or do you think I’m doing well? What do you think my worst and best pickups were? Elspeth seems like a bad pickup now but I got mine for about $20 in July and sold them in early Oct through buylist for $22 plus an extra 25% for store credit and another 8% member rewards discount. Made out pretty good actually. I think you just kind of missed the window on when to get rid of her. I really like the Anger and TSeizes. I’m really surprised by how little was bought. I was expecting more purchases in the 20-100 copy ranges, but at the same time a lot of your pickups are longer term holds. PS – the # of copies thing was just me assuming all the writers here were power trading large quantities of cards. Also want to emphasize while Elspeth looks worse now, it was a good pickup at the time. Josh, I set myself a personal budget of $150 per month that would go towards these types of pickups. Accounting for shipping, I averaged about $136 per month spending – I was successfully under budget for the time period. I wanted to set this budget for myself, otherwise I could dangerously go down the road of “Well, if I just pick up this card then maybe it will offset this loss I experienced…” Best to just make sure I don’t overspend. Very cool. That makes sense. I appreciate the feedback. A budget likely helps force you to think through those purchases as well. I traded in and got a box of Tarkir which I have not opened in hopes of turning it around and selling up. As a newbie to this idea of Magic finance, I thought this was a good way to go. After reading this, though, are you saying that prices for boxes will not go up? Matt, what I recommend against is cracking boxes for value – you can get lucky and pull a bunch of foil fetchlands or planeswalkers however in the long run you’re essentially gambling (unless you happen to be a store and sell everything at retail price). Buying boxes for the future is a fine move. I believe Sig over at Quietspeculation can tell you all about that. I am certainly not recommending against storing boxes away for a rainy day. Thank you for clarifying. My fingers were getting itchy. I enjoy your articles. Thank you! When I had read Josh’s post I also thought he was warning against storing boxes, which I actually do and have turned quite a profit (especially things like Unhinged, Ravnica, etc. ). I think the long term for boxes is good, but the turn around for short term is not great due to the volume with which Magic is printed now and the amount of packs cracked. I agree that cracking a box to get the “value” cards out of it is not as useful, and I have moved away from singles and into boxes as I do not follow the present Magic scene closely enough. My apologies, I meant Jared, I had looked up at the first comment. Thanks again for the article! I picked up Elspeth over the summer and won playsets for $60 so about $15 for 8 cards. I had a hard time flipping her when she was $21…pro tour hit and she rocketed up to $32 and then I got so much value. Even sold some to local store for $21 credit. Some of your buys on standard cards seem high like Ajani Mentor and Elspeth and non-foil Jeskai Ascendancy for $5 seems like a loss. I think you are right that eternal staples like mana confluence (even non-foil) are a good buy. But I did notice with the Conspiracy release and reprints of Chord and Urborg that non-foils can easily tank and foils retain value. The fetch lands of all types are a great example…the foils are holding their value or going up for the the onslaught and zendikar fetches but the non-foil prices got cut in half. I think spending more on foils or reserved list cards is the way to make more long term. I made a killing standard speculating on foil Coursers, Xenagos Reveler foils, Polukranos, Elspeths, Caryatids, Sarkhans etc but the window is so small it seems like too much of a risk. I wish I bought stuff like foil Council’s Judgement for $40 and foil Abrupt decay at $35 instead of playsets of Elspeth and other standard staples that I had to flip quickly….it’s too much stress. I have the option to cash out on Downfalls now and never play black for a year or knowingly take a loss by keeping them until rotation. However I know my foil Conspiracy Brainstorms are safe to grow for a LONG time. I traded about $110 in Elspeth (bought at $15), Sorin (buy at $12 prerelease), and Caryatids (buy at $6) for 1 light played Dark Confidant. In a year or 2 I’ll look like a genius…but would it have been better just to focus on Bob from the beginning? I admittedly have taken a loss on Foil Spirit of the Labyrinths…with Treasure Cruise hype I’m greatly considering cost averaging as the foils can’t possibly get any lower now can they? And they were a 2 of in the D&T deck that just won an open. That seems like solid speculation 😀 Thank you if you post…good honest writing too!! Spencer, I think you did fine trading up for Dark Confidant. Correct budgeting also would have got you there but I think the lessons learned from choosing undervalued cards, waiting for them to go up, and then trading for a popular eternal card outweigh a simple budget in this case. You can continue to use those skills to increase your collection faster as you get better at it. I also like foil Spirit of the Labyrinth long term! Personally though, I’m waiting until Theros block rotates from Standard. I think the biggest take away is that the time you buy your long-term holds is of prime importance. If the card is seeing standard play and that’s part of it’s valuation, you want to wait until right after they rotate out of standard to pick them up (in general). FOIL conspiracy Exploration, for example: reprint conspiracy doesn’t seem like it’s starting to gain value quite yet, eventually supply of this foil staple will run out and you’ll see the price START to increase. Until that time, you’re looking at small gains at best. So the best option is software to alert you of specific cards starting to seeing bottoming out stock, etc, THEN buy the foil exploration. Buying it 6 months before you’re going to start seeing gains is lost purchasing opportunity. Anyway, thanks for your insights! I would probably say Jeskai Ascendancy is your worst pick up – just because it was purchased when Khans was in its super-hype stage and Fall sets tend to tank it value all the way until Dec/Jan. Even if Ascendancy combo decks take off, the amount of Khans being opened will keep them reasonably low for now. Obviously, long-term I have no idea. Do you ever sell on Ebay? I know about the seller fees, but often you will still get a better return than from buylists…unless you have a large number of copies that you want to unload, then buylists are probably the way to go. John, I have sold on eBay in the past but in my experience selling rares and mythics it is much more efficient for me to buylist them. I would try eBay again for selling common / uncommon playsets because you can make significantly more selling these on eBay than to buylists. This is nonsense. You have no business writing articles about finance. People like you, who buy play sets shouldn’t be concerned about this stuff. Move along sonny boy. ??? I don’t understand this comment. I buy the common/uncommon playset of every set that comes out. I spot buy my rares but can typically buy a playset of anything save $100 cards on a whim if I really wanted/needed it. Why should I be any less concerned about making sure I’m maximizing my value. Same probably goes for the author. MTGFinance can be either minimizing costs associated with Magic or how to make money off it. I think having those who write articles from both perspectives is a good thing. Your article was what I aspired to do last week with my retrospective piece but I failed badly at it. I have a lot to learn from the way you write and structure your articles. I can’t agree more with those points you’ve mentioned. I have a weakness for being overly gung-ho about bulk rares (they are so cheap after all). My stacks of Heartless Summoning and Seance are still mocking me today. As for your selections, as you must’ve guessed, I really like that foil Erebos pick up at $16.00. He’s one of the most popular Theros God used in Commander both as a Commander and one of the 99. Just came across this article and website. As a long time MTG player but cannot seem to get out and play at many tournaments its nice to keep a little up to date with these informative articles. I remember reading in one of the articles (can’t remember which one) it mentioned that when trading with someone its best not whip out cell phones with SS price App since its hard to make trades up in value. I know at my local game store people do this a lot and it takes something away from the experience and can take longer as they want to look up everything. Maybe I’m living in the past when in high school with no cell phones/laptops… Have any advice? Doug, I’m afraid the new world of Magic trading is going to involve phones at first. The only thing I can tell you is be honest – once you establish a reputation for honesty, or even are willing to be the guy that gives up a few dollars in value on the phone trades at the beginning, then eventually the people at your LGS won’t demand a phone every time you want to make a $5 trade. Keeping on top of prices is key, of course. If you can be the guy to point out to a player “hey, that’s worth more than you think” it also goes a long way to establishing your reputation. As Corbin would say, reputation is key for being a successful MTG binder grinder.